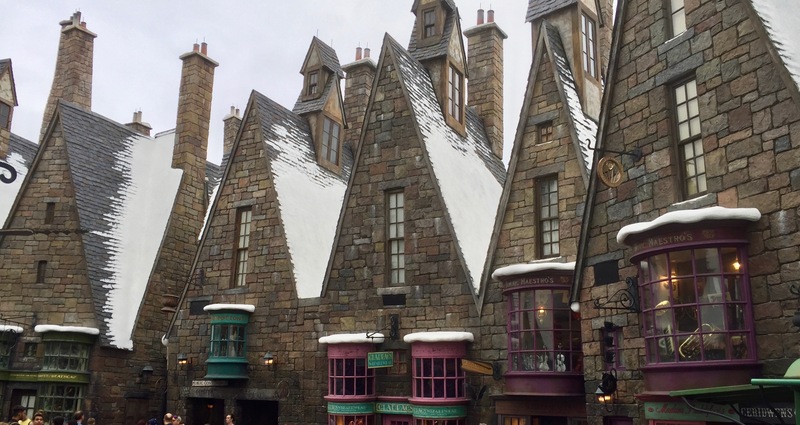 I’d wanted to visit Wizarding World of Harry Potter first-hand for years, ever since my own grandchildren reported their delight with the adventure. So I have to confess to a total cave on how to entertain myself while everyone else visits Florida theme parks. When day six of the family reunion dawned, I was excited to head out to Universal Studios with the rest of the family. My initial impression was one of realized fantasy. The enormous castle looming up over everything gave me a sense of eager anticipation along with a little foreboding — perfect evocations for a magical world. Framed pictures on the wall suddenly speak their opinions, just like in the books. 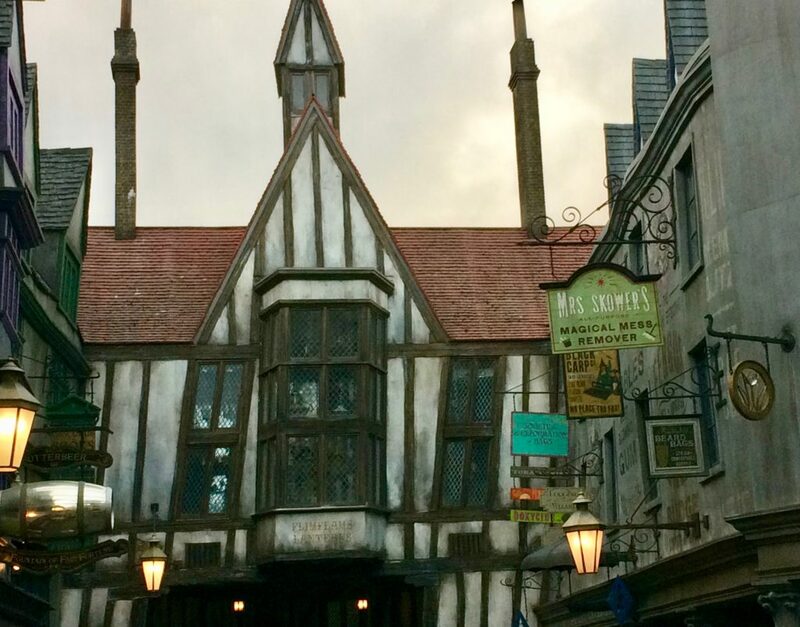 The architecture defies all known standards for Muggle world buildings. In fact, it’s hard to know for sure what’s up and what’s down in a world with no plumb lines. In this magic system everything I saw, did, and felt was consistent with my imagination. We poked around in the strange little shops and found amazing things we didn’t know existed. Fantastic dresses, cloaks, and hoods. Strange foods such as the Every Flavor jelly beans, and drinks of every imaginable taste. Wands that are sold with a demonstration of compatibility to the individual purchaser–and available in an amazing array of shapes, sizes, and composition. Broomsticks shaped for riding. Everywhere the unexpected. JK Rowling, author of the Harry Potter books, visited the summer of 2010 for the grand opening of the theme park. 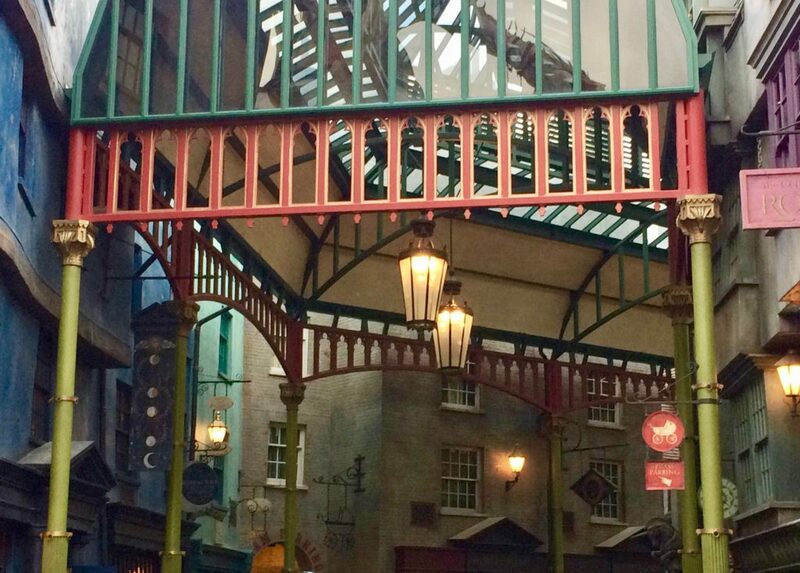 She compared the breadth of The Wizarding World of Harry Potter with the partialness of a film set where the enchantment necessarily “dissolves into scaffolding and lighting.” She said of her theme park experience, “The completeness of the vision is wondrous. It’s really breath-taking here.” And I couldn’t agree more. 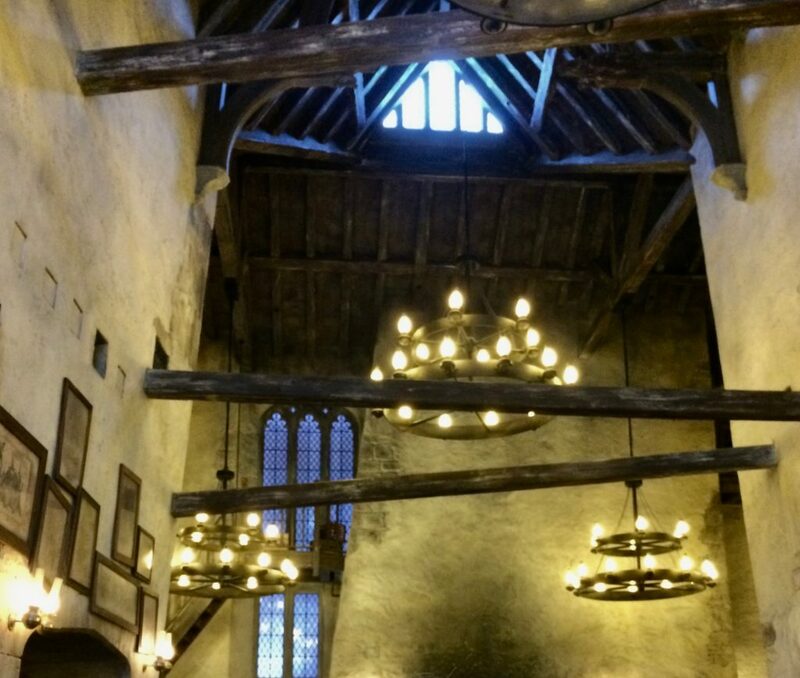 We had supper at the Leaky Cauldron. I happen to like British pub food and found this mostly an agreeable version. By the way, I really like Butter Beer. Expensive at the park, but delicious! The photo gives you a ceiling view. Maybe fifty feet high? It’s hard to tell. But the ceiling height relieves any sense of crowding in the dining area, despite people lining the sides of the long tables stretching from one end of the room to the other. 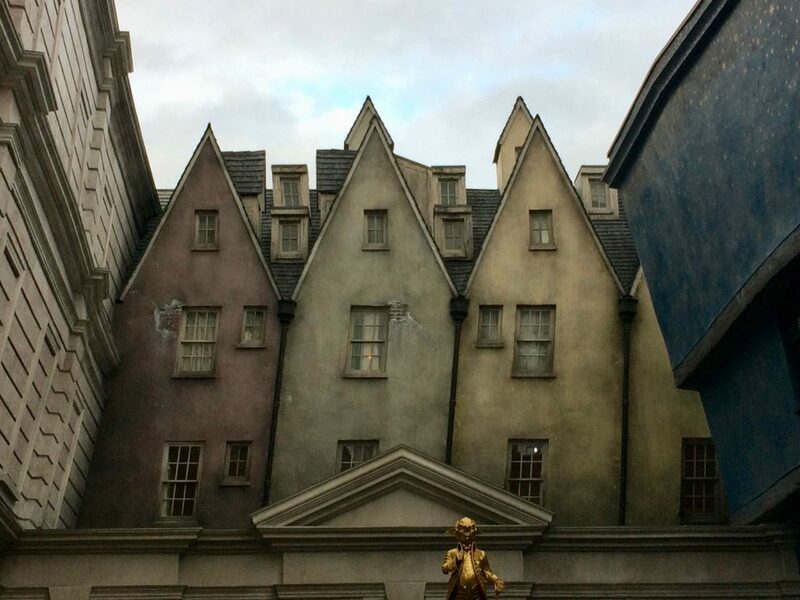 When members of the movie cast visited The Wizarding World of Harry Potter (summer 2010), Daniel Radcliffe said, “There’s never a moment when the illusion is broken. . . I was amazed by the place . . . it was fantastic.” Eight years later, I have the same impression. The photos above have been cropped to above crowd-height. I hope you can still appreciate the buildings as towering, other-worldly structures. But hundreds of heads in a photo sort of kill the ambience. 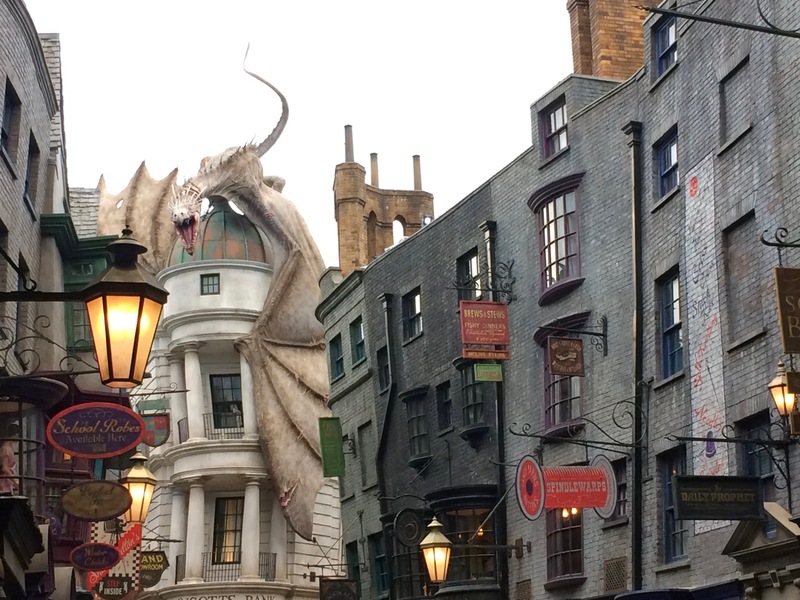 The Wizarding World of Harry Potter spans two different parks, so you have to buy tickets to both. 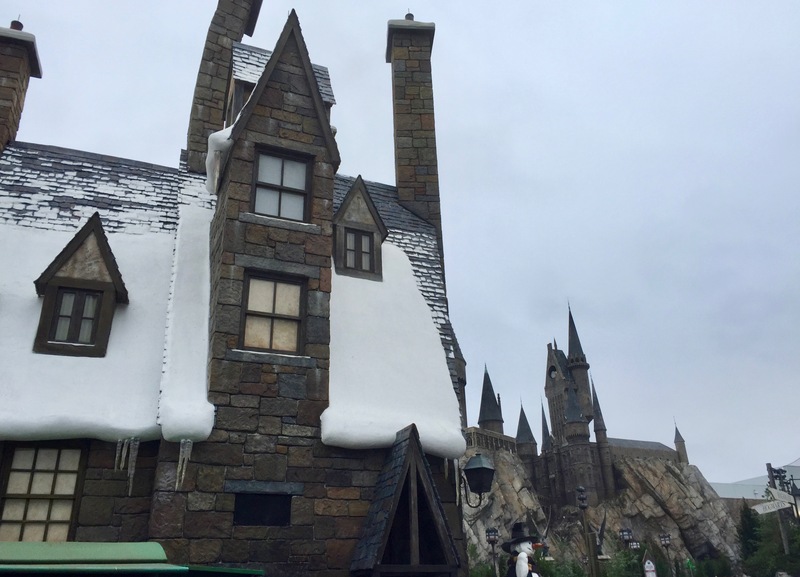 Visitors can access the Hogsmeade section and the Diagon Alley section via the park train. Hogwarts Express Train shuttles muggles and wizards alike through a simulated English countryside between the two stations, King’s Cross and Hogsmeade.